So, you really need a red technical pen. You’ve heard good things about Microns, but you can’t find them in red at your local store. 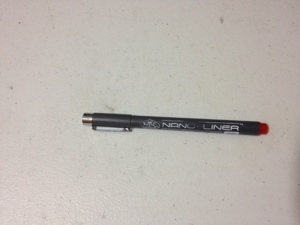 You instead find a red Royal Langnickel Nano-Liner pen. Is it a good substitute for a micron pen? Let’s see. First off, the body of the pen is not sleek. It is grippy as a result but feels a bit rough on the hand. All necessary information is printed on the side and is fairly hard to rub off, though it can be done more easily than with other pens. The metal clip on the cap does its job well and the number on the top is easily visible and rub-resistant. 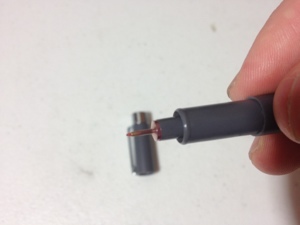 The ink is a bright red, unmistakeable for any other color. It’s brighter than most other red pens and would most likely have to be diluted to even begin to simulate reality. It is permanent and a bit more liquid than most technical pens. It bleeds through thin paper with ease and pools at starting and stopping positions. With card stock it works just fine, but with a heavy grain paper the line tends to seep out and become wider. Precession drawing is difficult, even with the 02, which would seem to make a line as big as a Micron 05. However, for large sweeping motions this pen seems right at home, just don’t push to hard and destroy the nib. So, is this pen an adequate replacement for a Micron? Certainly not! It does have several good points: large amounts of ink are good for long, and sweeping lines, but less so for the precision drawing it is marketed for. It does do the drawing job better than a standard office pen and is cheaper than a Micron. I think it’s really up to personal preference as with all art supplies, but one should really try a Micron first before checking this pen out.